Bergrettung Tirol - Med Dept. The basis of our medical aid lies in simplicity. In particular the difficult and dangerous situations in which we take care of injured individuals hardly allows us any leeway for complex medical action. The fact that the completion of evacuation can last sometimes for hours reuqires the element of time to be always factored which can be for us a great problem. Every movement and handgrip has to be well thought out. Ones own safety always has the highest priority! During the past years, the Mountain Rescue Tirol has increasingly modeled itself upon the military casualty managment system. As a result, there is close cooperation with the circle of experts of the prestigious Association TREMA e.V. (Tactical Rescue & Emergency Medicine Association e.V.) Interestingly, there can be found in mountain rescue many parallels with the military casualty management system. In both sectors it is important to stabilize and transport the injured with minimum of material and under dangerous conditions. We have combined in Tirol our own knowledge with the military basic principles resulting in a successful strategy with name of ``Tactical Alpine Medicine. 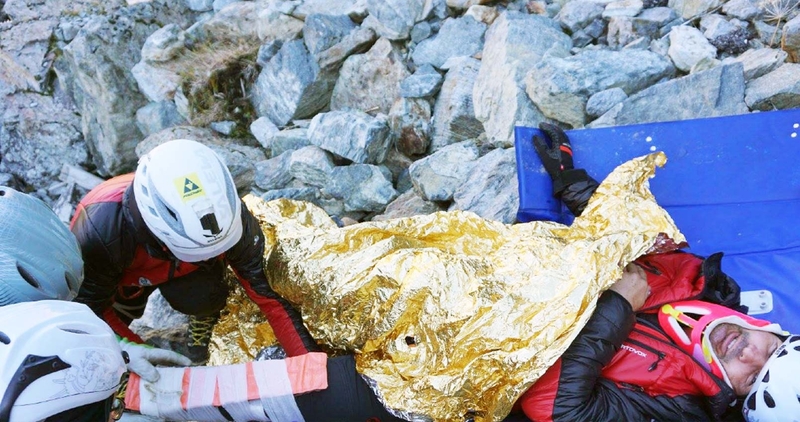 During the training as an ``Alpine Medic our theory is put into practice with extensive practical exercises. Each mountain rescuer completes during his basic training a three day ``alpine medic basic course´´. During his continuing education the mountain rescuer can augment the basic course with further advanced training courses which leads to becoming a fully qualified ``Alpine Medic´´.